Birinus was probably a Frank, consecrated a bishop by Archbishop Asterius in Genoa. In 634, he was sent by Pope Honorius I to convert the pagan people of Mercia. He landed at Portchester (Hampshire) and moved up through the Christian Celts of Hampshire to Silchester (Hampshire). Before he reached Mercia though, he encountered the pagan Saxons of the Thames Valley. Finding them greatly in need of Christian teaching, he decided to stay and was directed to the King's estate on the Berkshire Downs, probably at Cholsey (Berkshire). Here he met King Cynegils of Wessex who chose Churn Knob (Blewbury, Berkshire) as the site for the saint's first sermon. He must have thought this ancient pagan place to be a fine spot to intimidate the newcomer. However, Birinus was unperturbed and even managed to persuade the King of the merits of Christianity. Cynegils allowed Birinus to preach throughout his Kingdom, but it took a while before he himself was totally converted. The King was, at the time, desperately trying to finalise an alliance with the powerful King Oswald of Northumbria. Together he hoped they could defeat the hated Mercians. Cynegils arranged negotiations at his palace in Easthampstead (Berkshire), and the King of Northumbria travelled down to meet him. On reaching Finchampstead (Berkshire), the King became thirsty and prayed for water. The Holy Dozell's (or St. Oswald's) Well instantaneously sprang up and flowed fresh water. At the Royal talks, the only sticking point was that Oswald was a Christian and would not ally himself to any pagan. So the King of Wessex decided it was time to be baptised into this new church. Oswald agreed the alliance could then be cemented by his marriage to the daughter of the southern King. Birinus was sent for and, at the nearby Fountain Garth (Bracknell, Berkshire), Cynegils was baptised immediately. The bishop was given the old Roman town of Dorcic (Dorchester-on-Thames, Oxfordshire) in which to build himself a cathedral, and the Royal party travelled north to examine the site. On the way many of the Royal courtiers also expressed a desire to become Christian, so at the Brightwell (Berskhire) crossing of the Thames near Dorchester, Birinus arranged for a large proportion of his Court to be baptised en mass. The King's son, Cwichelm, resisted at first, but he was eventually converted to Christianity the following year. King Cynegils died in 643 and, about five years later, the new King, Cenwalh, invited Birinus to establish an important minster at Winchester. Other churches in Wessex have a lesser claim to a Birinian foundation: St. Mary's, Reading (Berkshire); St. Helen's, Abingdon (Berkshire) and the parish church of Taplow (Buckinghamshire), where the saint is said to have bapised the local Saxons in Bapsey Pond. These were the beginnings of the See of Wessex. 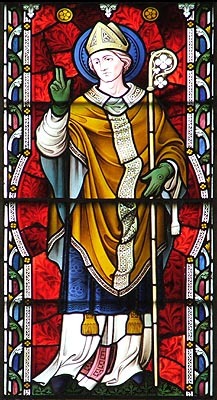 Birinus became its first Bishop and remained so until his death in 649. His shrine at Dorchester became a great place of pilgrimage, but controversy later arose when the Bishop moved his seat to Winchester and claimed to have taken the body of Birinus with him.